Any south Indian non-vegetarian meal is incomplete without a Masala Fish Fry. It is a very common and staple dish that is prepared throughout the coastal region of India. Often many like the small fish variety as they are tastier and crispier when it comes to fish fry. A nice spicy fish fry can be eaten on its own as an appetizer or starter or goes well with rice too. There are various ways of preparing the fish fry using different ingredients and spices to suit your taste. Normally, in southern India Fish fry is known as Meen Varuval. The fish fillets are coated with spices, marinated for few hours and then fried while in north India, sometimes besan is added to other spices and then fried. Fish fry simply best as a side dish or even as a starter. You can also use small fish fillet and deep fry or shallow fry to make it as finger foods which is a great choice for party or potluck snack. Pan fried Fish fry consumes minimal oil but still has a crunchy crust and taste delicious while deep fried consumes a lot of oil. We in India have several finger licking fish fry recipes out of which the authentic south Indian Fish fry is just bliss to the palate. It is absolutely yum, delicious, spiced with tangy fish masala. You could use small variety of black sole or murrel fish which taste extremely good. Fish fry can be made in the easiest manner possible by using different techniques of frying. You could use readymade store bought fish fry masala or make your own to coat your fish to fry. The fried fish would taste better if marinated and left for long or could be cooked as soon as coated. South Indian fish fry is famous for its style and can be done with just minimal ingredients. Pre-preparation or marinating the Fish: In a bowl add all the marinade ingredient and mix well to make a paste. Coat the fish pieces with this paste and marinate for at least an hour. The marinade has lemon juice and curd which will cure the fish to a certain extent hence don`t fry it too long else it might overcook and be rubbery in texture. Frying the Fish: Heat oil till it becomes hot and then slide in 2-3 fish pieces in the first batch without over-crowding the pan. Fry till crispy brown. Remove and place on a kitchen towel or paper napkin. Repeat the process till all pieces are fried and set aside. Place some lemon wedges and serve with accompaniment of your choice. Fish or Seafood dishes are easy and quick to cook, packed with good amount of protein and low in fat. 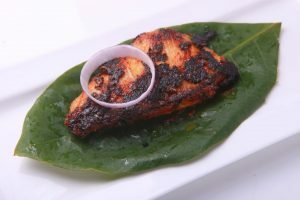 Pearl spot - karimeen fry kerala style is a sought after delicacy in Kerala. The pearl spot fish is marinated in a mixture of lemon juice, red chillies, and other ingredients and deep fried until crisp and golden brown. This recipe is an exotic dish of Karimeen fry cooked in Kerala style. The Karimeen fry is a spicy fried fish coated with zesty masala. Karimeen is one of the most important fish species in Kerala state and is also the state fish of Kerala. Coastal Fish Fry Recipe :This exotic shallow fried fish dish is a delicacy throughout the western coast and a must to try out. The combination of spices is so unique and the method of cooking is the best suited for this recipe. Aila Fish Fry is made of King fish. Here in this recipe, by substituting the King fish with a commonly consumed Mackerel (Aila, in Malayalam) and making such alternation in the traditional recipe that the authentic flavour of the fish is maintained. It’s a very simple recipe, quick to make and yummy to eat. Fish Fry South Indian : Fish fry or Chepa Vepudu, is a popular South Indian food recipe, fish simmered and marinated in an awesome spicy masala and cooked to perfection. It is simple, easy and a lip smacking fish fry recipe. Fish Fry Small Fish: is an excellent recipe made with small variety of Morel or Black sole marinated and stuffed with spices and fried to perfection. Crispy Fish Fry with Semolina Sooji Rawa Amazing fish fry made with fish coated with semolina, rice flour and spices combined and fried until done. Fish Patties is an excellent seafood snack, delicate flavours and a must try dish. Fish Fingers : are kids favourite snacks made with fresh fish cut into the shape of fillets (according to the size you require), marinated in fresh spices and deep fried until crispy. Massaged and Stuffed Indian Mackerel: Mackerel fish massaged and stuffed with shallots, mango and Indian spices and shallow fried. Make this kind of dish at home instead of having it out side. Fish and Chips: Seafood with British attitude, the best fish with tartar sauce. Fish and chips are a take-away crunchy snack that consists of battered fish and deep-fried chips. There are a various ways to cook fish. Talking from the health point of view the best ways are baking, shallow frying, grilling, poaching and steaming (Steamed Fish). I am sure that these fish fry recipes will greed up your palates and vouch for more. Hence I wish to try these recipes and enjoy their fantastic taste and aroma. You could always reach me at my below links: My Cooking Videos Indian Recipes Indian Food Regional Indian Cuisines VahChef Sanjay Thumma Enjoy Cooking!